Walk into Recharge Sport and you’ll probably find owners, Renee and Austin, either chatting with customers or taking care of routine maintenance around the gym. As athletes, Renee and Austin have combined their experience, education and training to build a business model around their vision of an ideal recovery facility in Bend, Oregon. Most runners tend to focus on their training mileage, speed work and long runs. While paying attention to stretching, nutrition and sleep is instrumental in maintaining a healthy platform, they are often a second priority. Often, runners and athletes are left vulnerable to injury due to neglecting their bodies and not dedicating enough time for rest and other recovery techniques. Recharge is hoping to change that. Renee and Austin met while running cross country for the University of Colorado in Boulder. After graduating with a degree in mechanical engineering, Austin decided to pursue massage therapy due to his continued interest in running. With a developing desire to learn how to heal the human body, he enrolled in the Boulder College of Massage Therapy. “I learned more about myself in those years,” Austin said, as he reflected on transitioning his career path from mechanical engineering to a non-desk job which allowed him to learn more about biomechanics and minimizing impact on the body. After completing his massage training, Austin moved to Flagstaff, Arizona where Renee trained as an elite runner at Northern Arizona University’s Center for High Altitude Training. It was here that Austin trained under massage pioneers, Phil and Jim Wharton, and Renee learned about professional training and recovery methods from world class coaches and physicians, including Jack Daniels, Ph.D. She went on to win the 3,000 meters at the USA Indoor Track and Field Championships, and the couple moved back to Colorado where Renee trained at the Olympic Training Center in Colorado Springs. It was here where they discovered the ultimate recovery center. Sidelined with a severe Achilles injury, Renee traveled to Sweden for surgery. While there was a 50/50 chance that she would never run again, the recovery methods she discovered at the Olympic recovery center were priceless. Through physical therapy, she learned to incorporate finding the root of a problem rather than just trying to apply a quick fix. Along with Austin’s education in massage therapy, they both knew they wanted to take what they had learned and provide a similar service. Their business model not only targets athletes, but everyone with a desire to prevent future medical problems by strengthening their health and well-being. 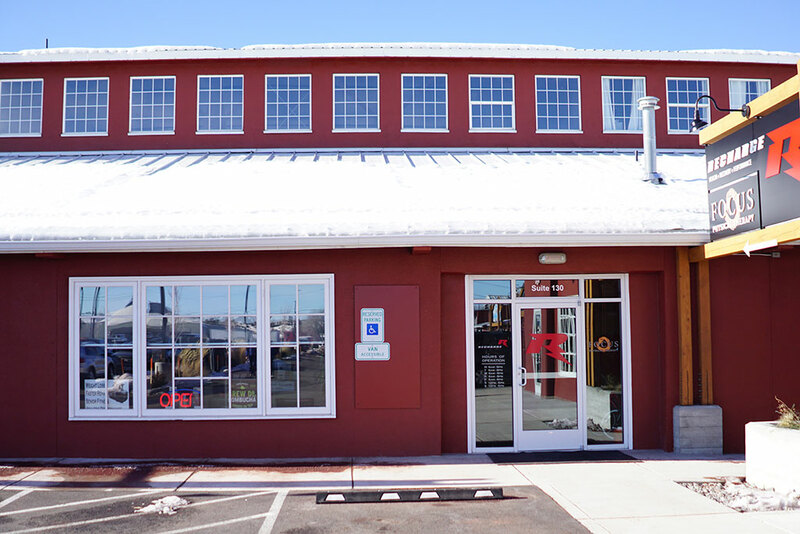 When Renee and Austin opened Recharge in 2013, they occupied a small space near the Old Mill District in Bend that was just large enough to fit a few recliners for compression boots, a small weight gym, locker room and loft for Austin’s massage therapy sessions. Fast forward to two years later and just a couple doors down, and Recharge has transformed into a customized space all their own. Renee and Austin will tell you that the process of constructing their own gym was frustrating and exhilarating all at once. As a brand new business model, everything from permits to insurance was harder to come by. But in January of 2015, they opened the doors to their new, expanded facility. This one-of-a-kind gym features numerous rooms for massage therapy, nutrition analysis, and acupuncture, and a physical therapy studio. The athletic recovery space is an open area with theater lounge seats, free wifi and flat screen TVs mounted to the wall. For those with injuries, or looking to recover from a big race, ice compression or massage boots can help the body by speeding up the healing process. There are also hot and cold tubs, as well as a full-spectrum infrared sauna – all of which are key components in workout recovery and injury prevention. From core strength training to recovery yoga, Recharge seems to have filled a niche when it comes to meeting the needs of runners and those looking to improve their health and wellness, not to mention always bringing in new equipment. The ElliptiGO is an elliptical bicycle that’s been designed by runners as an ideal cross training device, and you can find them at Recharge for demo, rental and personal instruction. While Recharge’s location in Bend has been open since 2013, they have found other people to manage branches in Eugene, Portland, Vancouver, Reno and Seattle (opening soon). Each location is privately owned, but Renee and Austin have made sure to choose like-minded people who are dedicated to sticking with their true vision of marketing towards everyone, not just athletes, and realizing their goal of offering a place that helps people make education-based choices, while reducing the need for medication and increasing opportunities for an active lifestyle. Recharge offers membership punch cards (10 punches for $99), that are good for any one service at a time, or a monthly all-inclusive membership fee of $125. They are always scheduling weekly runs and other group events, which are often free and a great way to meet others. Visit rechargesport.com for more information.